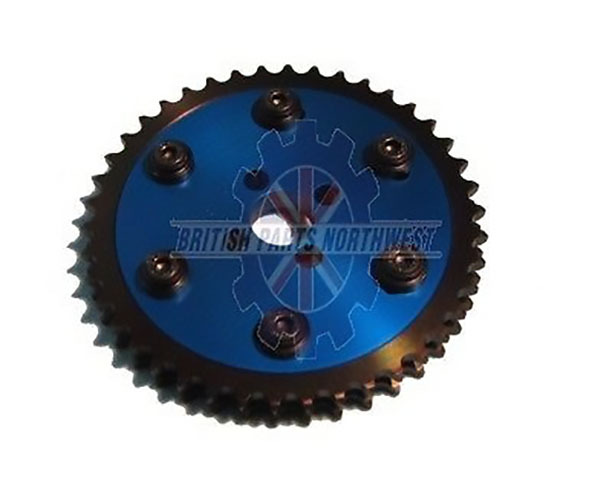 This is a adjustable cam gear for a Triumph TR3, TR4, TR4A. The Vernier Dual Camshaft gear has a center which attaches to the camshaft and the outer gear is adjustable. You can loosening the allen bolts, the gear then can be rotated thereby adjusting the camshaft relative to the gear. This method of camshaft timing has two advantages; firstly it makes the task of timing much easier than when using offset keys and secondly it permits further advancement of the timing. Advancing camshaft timing, that is making the full inlet valve lift occur before the rotation angle specified by the manufacturer, will make the engine produce more torque lower down in the rev range while losing a little of the top end power. Thus a vernier cam gear allows a camshaft's characteristics to be changed and adjustment to be perfect.